Red2120's Club Penguin Cheats, Secrets, And Give Aways! : Party Topic: Halloween Party On the way! Party Topic: Halloween Party On the way! With only 5 days left until the Halloween Party, the staff want to know what you guys are doing to prepare for the Halloween party! So with that said, Gary will be coming to Club Penguin on the 29th. I will be opening up a tracker so when ever I find him I will tell you! If you need help finding Gary click here. 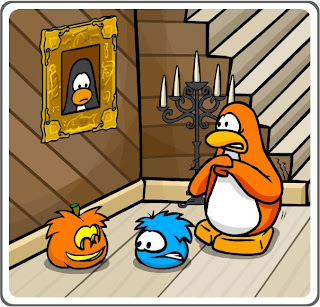 Now i'd like you to comment on this telling me what your doing to get ready for Club Penguin's Halloween Party 2010! Leave a comment with 50 - 75 words telling me what you will be doing! Next week I will then post your answer in the next Party Topic! member plz? what is tagging, anyways?????? what am i doing??? hoping for a membership (dont feel bad, im just saving) and hopefully i will get one. until them im using my sister's account, and she doesnt have any money, so im just gonna wear random items. on webkinz, im tricking out my account and pets. im also setting timers for reds,my,and a couple other peoples halloween partys.